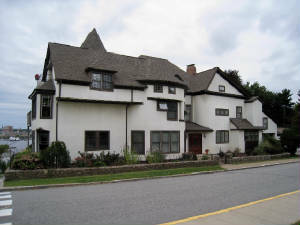 Example of an English Tudor Style house on Groton Bank. Smith’s original Federal style was extensively restructured about 1890 by Mrs. Abby D. Slocomb into a Tudor style mansion called “Daisy Crest over Groton”. She was a woman activist of her day, founder of the local DAR and submitter of the design for the Connecticut State Flag still flown today. This web site is sponsored by the Groton Bank Historical Association, Inc. (GBHA). GBHA’s objective is to research and promote the history of Groton Bank and to maintain the historical architecture and village character of this area listed on the National Register of Historic Places. To accomplish this GBHA publishes information about Groton Bank and sponsors several historical-educational meetings annually.